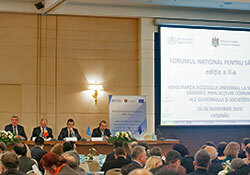 A National Health Forum in the Republic of Moldova convened for the second time on 25–26 November 2013, bringing together over 400 decision-makers in Chisinau for a policy debate on health reforms. Participants represented the health and other sectors at central and local levels, the Parliament, Prime Minister’s office, diplomatic missions to the Republic of Moldova, international organizations and partners. The Forum, entitled "Towards universal health coverage through joint efforts of government and society", is becoming a broad platform for moving forward in a transparent and participatory manner. The event is an important part of the policy dialogue led by the Ministry of Health and supported by WHO and the European Union (EU). In 2013 policy dialogue among health sector stakeholders and development partners focused on priority issues related to tobacco control policies and hospital sector governance and regionalization. Also on the agenda were decentralization of public services, health services efficiency and quality, health financing and local authorities’ and community involvement. Welcoming the participants at the November meeting, Minister of Health Andrei Usatii said: "In 2013 health insurance coverage of the population increased to 83%. Through further strengthening and increasing the autonomy of the primary health care sector, 192 health centres out of 262 across the country have signed financial contracts directly with the National Health Insurance Company. In the last year, 78 primary health centres were repaired and equipped with medical equipment. This has allowed access to quality health services for one million people." Mindaugas Kacerauskis, Political Officer of the European Union Delegation in the Republic of Moldova, mentioned that "The European Union keeps health issues among its priorities and has continuously supported the Moldovan Government’s efforts in reforming the health sector. Trilateral cooperation between the EU, the Ministry of Health and WHO has allowed us to reach effective coordination in the health sector." The input of national leaders and stakeholders as well as experience and lessons learnt from other countries at regional and global level presented by WHO will help the Republic of Moldova select and apply best practices and strategies at the country level. It will also lead the way for development of strategic legal and policy frameworks, like new tobacco control legislation, the National Public Health Strategy and the currently under development Strategy for Accelerating Health Reforms with a particular focus on service delivery. During roundtable discussions, participants reviewed progress and watched the video "Addressing NCDs in Republic of Moldova – developments in past years". "A year ago we discussed more broadly the reforms related to universal health coverage and addressing noncommunicable diseases, but now the focus is sharper in addressing tobacco control to make smoke-free public places a reality; and here whole-of-government actions are now needed," said Dr Jarno Habicht, WHO Representative in the Republic of Moldova. "Further, the health service delivery reforms addressing equitable access to quality services and increasing financial protection is continuously on the agenda for the country".